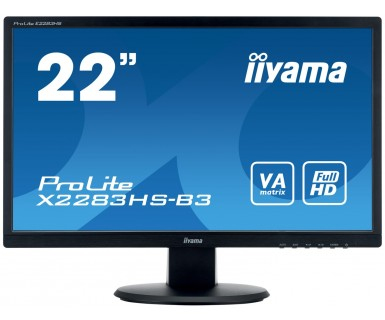 The ProLite X2283HS is an excellent 22â€ Full HD LED-backlit monitor with 1920 x 1080p resolution and VA panel technology guaranteeing accurate and consistent colour reproduction with wide viewing angles. Triple Input support ensures compatibility with the latest installed graphics cards and embedded Notebook outputs. The X2283HS is also equipped with two high quality stereo speakers. TCO Certified, this monitor is a reliable solution for both home and office use.